A British, native tree, Scots Pine (Pinus sylvestris) is the widest distributed conifer in the World found at elevations from sea level to 2400 metres in some of the most diverse environments. 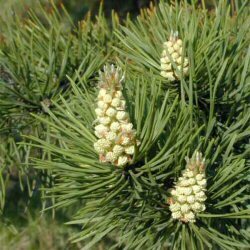 Interesting that it is so widespread seeing as though Scots Pine is shade intolerant with seeds unable to germinate under its own canopy. Mainland Europe can expect heights of up to 36 metres but average UK heights will be 20-25 metres. As a young tree, it is quite popular as a Christmas tree but you can expect a 300-year life span with odd stubborn tree reaching 520 years. So Scots Pine Christmas trees could really be passed on down the generations, not quite the inheritance you might of expected. Scots Pine (Pinus sylvestris) is unusual in that there is no one specific shape for the tree. There are over 11 growing forms or shapes that appear as the tree reaches maturity. The bark differs with young branch bark being papery thin and orange/red with the older trunk bark being red/brown made up of plates/flakes up to 5 cm thick in total. Scots Pine is an important commercial forestry species in Britain with its wood being highly prized for use in building. An attractive tree with an interesting shape, somewhat jagged branches is a feature as the tree ages. Also one of the backbones of the forest, which many animals and plants depend on. The needles are like ears in that they grow in pairs but unlike ears, they are blue/green in colour and about 5 cm long. After several years, they turn yellow and drop off (good job ears are not like needles!) around September October time. One of the amazing facts about Scots Pine (Pinus sylvestris) is that the resin provides a natural preservative. The tree can die and remain standing for over a century as the resin slows the wood decay rate. Something that keeps things standing for a 100 years, sure there is a Viagra joke in there somewhere. Both sexes of flower appear on the same tree but the females prefer to be on the tips of the upper branches while the male flowers occupy lower. They are pollinated by wind and fertilised female flowers can take two years to transform into a cone (and I thought my girlfriend took a long time to get ready). The cones open in April allowing their load of seeds to be dispersed by the wind with the ones falling directly to the floor being most unlikely to germinate from insufficient sunlight. Expect around 100 metres of travel, considerably more over a smooth surface such as ice. Cone production is sporadic cycling every 3-5 years producing anywhere from zero to 3000 cones. If you are planting a wood of Scots Pine (Pinus Sylvestris) then you need to protect from Deer as they eat the main leader of the saplings and strip the bark, particularly towards the end of Spring. Typically, Scots Pine is planted in groups of between 10 and 25 trees. This number of trees is ideal for creating a wildlife habitat and a meaningful source of food and shelter. Spacing may vary between 1m (3ft 4in) and 5m (16ft 8in). Blending of one species into another is suggested although bearing in mind different growth rates. The aim is to mimic what nature intended and thus avoid artificial lines. Scots Pine works well with native deciduous trees (trees which lose their leaves during winter), and provides winter shelter and colour in native woodland. This tree is a major native, British tree and as a result included in a range of new native woodland. Typically, Scots Pine may be planted as an individual tree or as an avenue of trees. Estate and Policy Woodland plantings from the 18th Century often found this tree planted along with other conifer species. Today, 150 years later these trees form an amazing sight and we think that this tree worthy of planting to achieve the same effect for future generations. Rabbit and Deer ProtectionWe offer a range of tree shelters that will protect your trees against possible attack. Click on this Tree Protection Link and it will take you to all of these products.